One morning while making breakfast, her daddy discovered that they were out of milk. 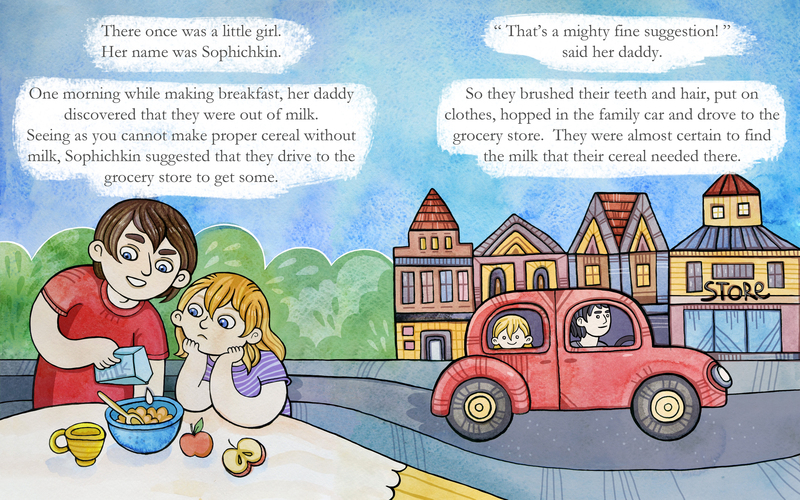 Seeing as you cannot make proper cereal without milk, Sophichkin suggested that they drive to the grocery store to get some. “That’s a mighty fine suggestion!” said her daddy. So they brushed their teeth and hair, put on clothes, hopped in the family car and drove to the grocery store. They were almost certain to find the milk that their cereal needed there. 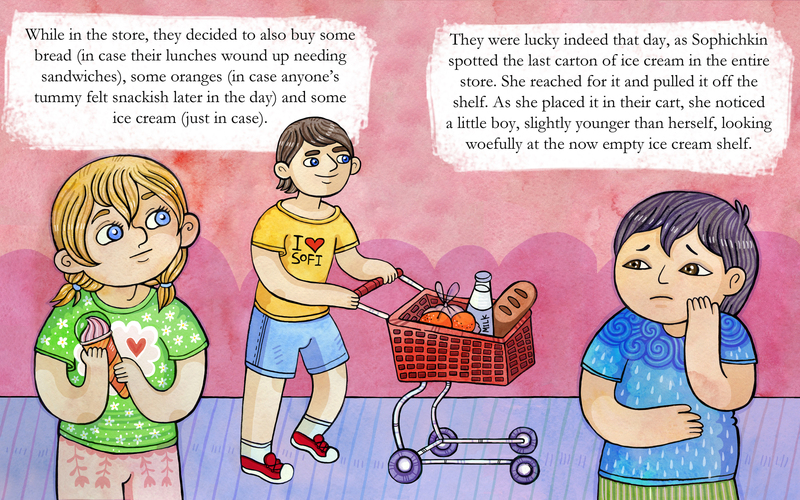 While in the store, they decided to also buy some bread (in case their lunches wound up needing sandwiches), some oranges (in case anyone’s tummy felt snackish later in the day) and some ice cream (just in case). They were lucky indeed that day, as Sophichkin spotted the last carton of ice cream in the entire store. She reached for it and pulled it off the shelf. As she placed it in their cart, she noticed a little boy, slightly younger than herself, looking woefully at the now empty ice cream shelf. His tummy quite obviously had its heart set on eating some ice cream that day, and now it would have to do without. Sophichkin looked on sadly, seeing the little boy’s face, heart and tummy all frowning at the same time. 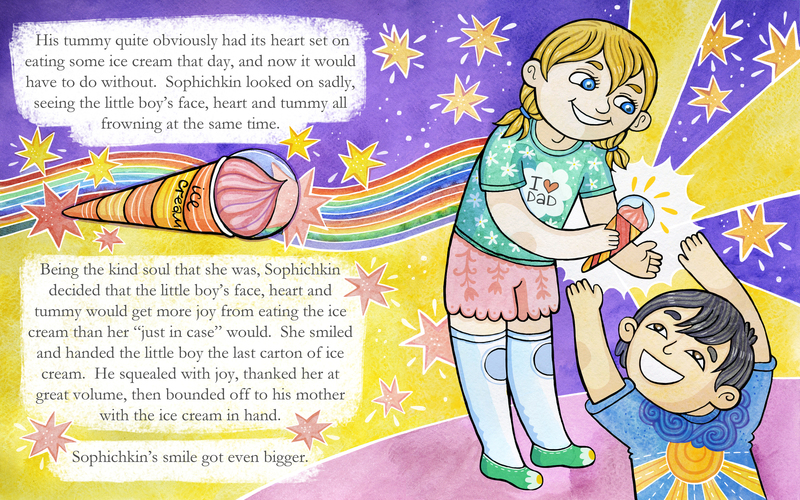 Being the kind soul that she was, Sophichkin decided that the little boy’s face, heart and tummy would get more joy from eating the ice cream than her “just in case” would. She smiled and handed the little boy the last carton of ice cream. He squealed with joy, thanked her at great volume, then bounded off to his mother with the ice cream in hand. Sophichkin’s smile got even bigger.